THE Dinosaur Toys Blog Archive. You wanna Papo Spinosaurus click here to get one of your own from Amazon! The Dinosaur Toys Blog Archive Search Box. 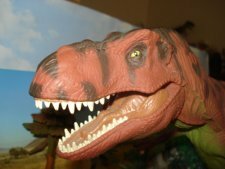 Due to popular demand we have instituted the Dinosaur Toys Blog Archive where you will find the best of the Dinosaur Toys Blog. A blog is great fun but is it a business too? Check here to find out. A melange of photos from the Dinosaur Toys Blog (and other sources) that have drawn comment, for one reason or another. A compendium of blogged Dinosaur and Dinosaur Toys NEWS stories. These are right out of today's headlines and are usually illustrated by Rexford to improve understanding. Good luck with that. The Complete Rexford Focused Blog Archive for 2010 January 1 thru December 31, 2010 Rexford From New Years to New Years Eve. Aliens, Extinction, Creation, Dinobabe and Dinotot, the DMV, Christmas, Halloween and more. Rexford Goes Shopping: Blogs collected from Rexford's adventures in various retail establishments. Some still exist. Various dates beginning in April 2010 through today. The Ecological Niche Blog Bridge (bridgehead? ):Comparing Dinosaurs to their contemporary analogs March 20; April 14 thru May 19, 2010 And Rexford is there to help compare. Dragon Blog(s) Series: March 27, April 1-6, 2010 Rexford discovers that Dragons aren't a drag even if they aren't Dinosaurs. PT Blog- There's No Accounting for a Taste for Pain: March 28, 29, 30 & 31, 2010 Rexford discovers the "P" in PT stands for pain. And passes it on. Pachy-politics and Thin Skinned (but tasty) Politicians: March 21, 22, 23 & 24, 2010 Why can't we all just get along? Find out here! Rexford's Fall From Grace: March 4, 5, 6, 7, 8, 9, & 11, 2010 Rexford has an non-work related accident and suffers the consequences. Don't let this happen to you. Rexford does Wal-Mart: February 24, 26, 27 & 28, 2010 The title says it all- Rexford runs rampant. Here's Your Sign & A Question of Control: February 23 & March 2, 2010 A Walk in the Woods spoiled by an untimely fall and Don't Play Misty for Me. The Sue Field Museum story in words and pictures: February 15, 17, 18 & 19, 2010 Two Sue and her Anatotitan and Torosaurus cohorts show why bigger isn't necessarily better and why you should pick them up. Papo Parasaurolophus, Marx Ankylosaurus and the Safari Coelacanth: February 2, 3 & 6, 2010 The PAPO Parasaurolophus has been featured before and makes for great photos. The vintage MARX Ankylosaurus is in contrast to the very new and highly detailed Wild Safari Coelacanth. Fifty-five years separates the creation of these figures. Check 'em out. Dinosaur Babies Childcare Bridge- From Eggs to Nursery School and Dinner Date/Baby Buffet: January 26, 27, 29, 30 & 31, 2010 Child care in the Mesozoic was fraught with danger. What was a mother to do? A Head Cold? : January 24, 2010 Rexford has trouble coming up with an idea. But "Trouble" is Rexford's middle name. Rexford at Play, Mamenchisaurus at Risk & Mamenchisaurus at Large & Mamie Trips Out: January 20, 21 & 22, 2010 Rexford has a good time and we are visited by a Mamenchisaurus from Indiana who makes friends but, like Dorothy, knows that "there is no place like home." The Garden of Eaten & Camarasaurus: "The Big Mac" of the Jurassic: January 17 & 19, 2010 Finding food can be quite a chore when you are bigger than a store. Your Chariot Awaits: January 13, 2010 Rexford may not be the best auto mechanic but he certainly knows where his next boat payment is coming from. Generic Velociraptors Rule, or Else- A Styracosaurus Makes a Point plus New Years Picture & Rexford's New Year's Nightmare: January 9, 10 & 14, 2010 Some Bully-boy Raptors get their comeuppance from the future, "Spike" breaks bad and a New Year's Photo. The Raptorex, Try Ceratops, Redecorating "This Old Dinosaur" & Something's Fishy and Rex Improves His View: January 2, 5, 6 & 7, 2010 A new discovery, Ceratopsians rule(! ), Velociraptors get a makeover, Rexford picks a pet and frames his new outlook. Lead Up to the New Year, Happy New Year & Post Christmas New Year Blooz: December 28 & 31, 2009 and January 1, 2010 Checking out the gifts, a New Year's party and the inevitable post Christmas New Year letdown. A Christmas Chorale, Santa Claws or Not so Merry Old St. Nicked & Christmas says Goodbye: December 24, 25 & 26, 2009 A Christmas Serenade, a tragedy averted and a feeble (but tasty) attempt at building bridges. The Riches of Crowseus & Happy Movies: December 21 & 22, 2009 Our crow sized MicroRaptor gets too big for his riches and Rexford goes shopping for Family rated movies. A Mercenary Plateosaurus and Snow Arrives: December 18, 19 & 20, 2009 More Plateosaurus hubris and a considerable snow blankets Dino-town, drawing out all the residents. The Marx Plateosaurus Buy the Farm and Plateosaurs and Temperatures:December 15 & 18, 2009 Plateosaurs prove to be more mercenary than expected and Rexford falls ill with a p.i.t.a. A Rexian Gothic, Narcissosaurus Rex and the Pleasure Garden of Kubla Rex: December 13 & 14, 2009 Rexford recreates art in a Dinosaur toys fashion and proves himself to be a "real work of art" as well. Ouch & Feathers Tickled My Fancy: December 8-10, 2009 A surprise injury ends a hunt and leads to a visit to the emergency room. The MPC Stegosaurus & A Visit to Sam's: December 8, 2009 A much maligned (by me) Stegosaurus and a Big-Box visit with relief at the end of it. A Fly in the Ointment: December 6, 2009 Rexford visits a local airport where a flying friend lands for lunch. But whose? This Should be an Embarrassment & Rexford Meets a Neighbor: December 2-4, 2009 Tasty impostors and neighbors keep Rexford making short-term friendships. Tyrannosaurus Wrecks & Tyrannosaurus Wreaks: November 28-29, 2009 When Tyrannosaurs get to work on their own pages. A Tyrannosaurus Pig Thanksgiving Dinner Guest: November 26, 2009 Tyrannosaurus Rex and Meat. They leave the table, together. A Dinner Guest, Saur-0-Pod-People & Precious Predators: November 23-24, 2009 When inviting guests to dinner be sure they are compatible. No page? Get to Work!! : November 18, 2009 And always make sure your contractor is licensed, or competent (or at least familiar with his equipment). Baby Dinosaurs: Pre-School or Menu? You Decide: November 16, 2009 Always check the credentials of your daycare center. The five-day Beach-blog bridge: brought to you by November 8, 9, 11, 12 & 13, 2009! Where wine, medicine and the sea all collide in a tsubloggi. Our Halloween 2009 Blog:October 31, 2009: Ghosts, Tyrannosaurs and candy don't necessarily mix. The State Fair- 2009: October 20 & 21, 2009: A visit to the North Carolina State Fair and why Tyrannosaurus Rex can be trusted with your child(ren). The Para-legal-ophus: October 16 & 17, 2009: The story of the PAPO Parasaurolophus. Its 'near-death' experience and the legal firestorm that ensued. The Dinosaur Toys Blog Archive - Where Blog History returns to life. We here at The Dinosaur Toys Collectors Guide have only one purpose in being here at all. Providing you, our readers, with the best, most informative and entertaining information about Dinosaur toys both past and present. Hence this Dinosaur toys blog archive. 3) Social Networking links (way bottom) so you can share this page, and our site, with your friends. Thank you. 4) Our mighty and inimitable Search-osaurus Center. (Click link or Below.) You can use the search bars to either search the site for all things Dinosaur (toys) or search the entire web for all things anything at All-a-saurus. 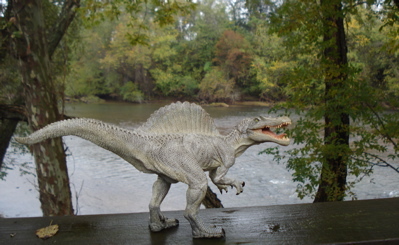 Click this link to go to the source material for The Dinosaur Toys Blog Archive.